Labskaus is a one-dish meal made with mashed potatoes, corned beef, and beets. It’s bright red from the beet juice and served with a fried egg, pickles and pickled, rolled herring (Rollmops). Labskaus used to be a poor person’s food, but now pickled meats and fish are so expensive that it has become a luxury food, even served at fancy restaurants. It also has a reputation for being a hangover cure. Brown the onions in 2 tsp butter for 3 minutes and remove from heat. Brown the corned beef cubes in the same pan until warmed through. Chop 5 beet slices small, reserving the rest. Drain the potatoes and add the milk. Mash the potatoes with a potato masher (they will be chunky). Add enough broth to make the potatoes wet, but not runny. Fold in the browned onions, chopped corned beef, chopped beets, and the beet juice. Season with salt and pepper. Using a non-stick pan, melt 2 teaspoons butter and fry the 3 eggs. Salt and pepper to taste. Divide the Labskaus onto 3 pre-warmed plates. 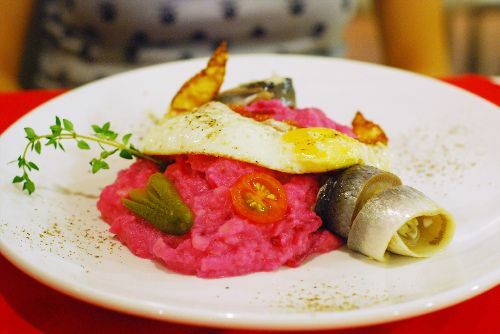 Arrange one fried egg on top of each mound of Labskaus, add the Rollmops, the reserved pickled red beets and spicy German pickles and serve immediately. Tip: Pre-warming the plate is essential for total enjoyment of this meal because it can cool down so fast. Place plates in an oven that has been heated for a few minutes and then turned off. Use potholders to remove them shortly before serving.